Enterox provides a new breed of enterprise solutions as cloud services for ERP software (business solutions) & mobile apps that seamlessly connect with telephony systems & embedded computing devices for Internet of Things (IoT). 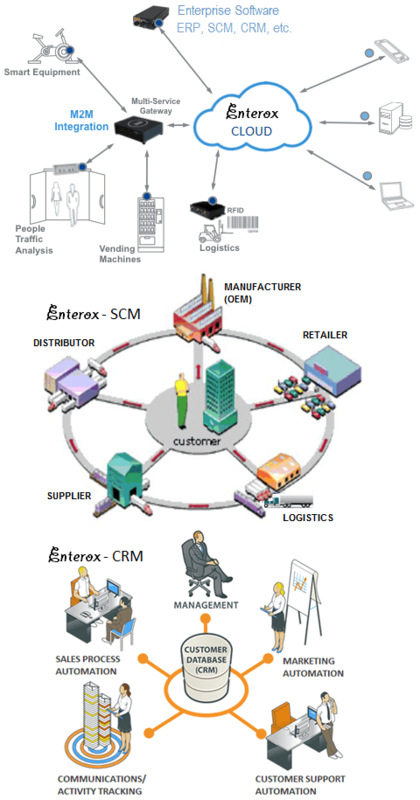 Enterox Cloud (formerly known as Eraspaas) is a cloud based 'ERP framework' with many built-in business modules as solutions that enable setting up enterprise IoT solution in nearly no time. The service is leveraged for developing IoT application, custom software, mobile app and GPS solutions that connect with business software. "In a nutshell, Enterox Cloud is a platform providing different combination of apps (business solutions and IoT connectors). It makes business applications connectable, flexible and scalable." GPS Vehicle Tracking (GPSVT) is a GPS based vehicle tracking system for tracking fleet of vehicles. It is also possible to pick and choose solutions and further extend or customize them to fit precisely with specific business processes of a company. Besides the above list of solutions we also provide uniquely tailored solutions for companies that require software based on their specification. How does Enterox Cloud work? "Enterox cloud provides a framework for converting software architecture and design into working business applications through simple configuration and plugins. These configuration and plugins are packaged into different business solutions." Enterox business productivity tools for ERP, SCM, CRM and other processes brings a completely new level of business automation with integration of SMS gateway for personalized messages or alert notifications, telephony system for Interactive Voice Response (IVR) or Computer Telephony Integration (CTI) and Device Gateway (or IoT Gateway) for integration with embedded computing devices via IoT protocols. 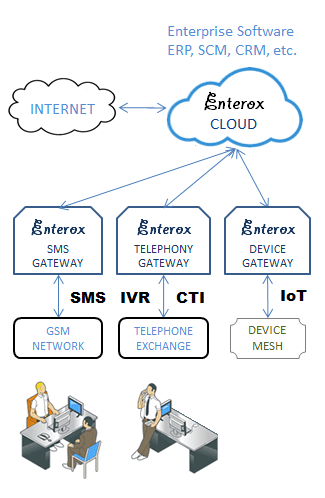 Besides the inbuilt capability of sending, receiving and processing emails; Enterox Cloud along with Enterox Gateways open channels for communication over new mediums such as GSM or telephony network that enables a new set of capabilities for the productivity tools running on Enterox cloud platform. Further Enterox Device Gateway extends the Open API of Enterox Cloud to support IoT protocols such as MQTT (Message Queue Telemetry Transport) and CoAP (Constrained Application Protocol) [with some limitations], however the gateway also introduces an extended WebSocket protocol to support seamless bi-directional communication between devices and Enterox Cloud serving as an IoT platform. Enterox Telephony Gateway supports both outbound calls and inbound calls (routed through IVR), thus enabling highest degree of automation of business processes that can directly update or provide information from business solutions such as Marketing, Sales, Support, Inventory etc. as defined by the business rules. Further also providing the possibility of recording conversations as a phone call activity. Similar to the Telephony Gateway Enterox SMS Gateway also supports both outbound and inbound sms messages, they are leveraged for personalized marketing messages or success notification with sales transactions. Further they also serve in improving efficiency by providing immediate alerts on critical business cases for example when items in inventory reach a minimum threshold. Enterox Device Gateway (also called as Enterox IoT Gateway) adds support for the new technology of "Internet of Things" to Enterox Cloud, thus transforming it from a cloud platform for business applications to a fully-feature IoT platform. This ability of Enterox Device Cloud as IoT platform is leveraged for delivering a completely new consumer experience. Enterox Device Cloud supports Websocket and Message Queue Telemetry Transport (MQTT protocol) that enables Machine to Machine (M2M) and Device to Device (D2D) communication with examples to show how to setup a Device Mesh. All of the above ERP modules available with Enterox Cloud as Enterprise Software with Enterprise Messaging (SMS) can be extended with IVR system. How does Enterox Cloud scale up with business growth? Enterox cloud system ensures high availability and reliability of business solutions running on it by performing automatic load distribution in a server farm environment. This characteristic of Enterox cloud allows it to scale up along with the business both horizontally and vertically. Enterox cloud provides Open API that allows other software system (or websites) to connect with it for publishing or retrieving information. In addition, it is one of the rare few platforms that is supporting future technologies like "Internet of Things" (IoT). Enterox Cloud provides the flexibility of ERP integration with custom software development and mobile app development that serve as productivity tools for organizations. Besides using the platform for compute and data storage such mobile apps can also connect with smart devices by leveraging the IoT capabilities of Enterox cloud as an IoT platform. Besides enterprise software as service for ERP solutions, Enterox also provides a suite of IoT devices that integrate with enterprise solutions running on Enterox Cloud. The first in the series of our Enterox IoT devices for Internet of Things is Enterox Arduinet, designed for embedded applications that communicate with cloud platform for Smart Building, Smart Factory, Smart Retail Store or Warehouse Hub and similar IoT applications. 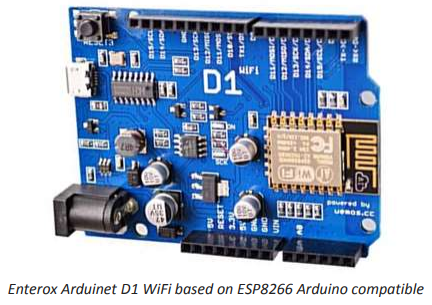 Enterox Arduinet Board is built on Arduino Compatible Board with wired and wireless networking module for programming and connecting embedded computing devices with TCP/IP network and server systems over the internet. Arduinet is designed to facilitate implementation of Internet of Things (IoT) specifically for retrofit scenarios that require setting up communication link between devices that support legacy ports and protocols with latest enterprise systems that provide applications programmable interface (API) supporting web and IoT protocols such as HTTP(S), WebSocket and MQTT. Subscribe and get exclusive discounts on Enterox Products!